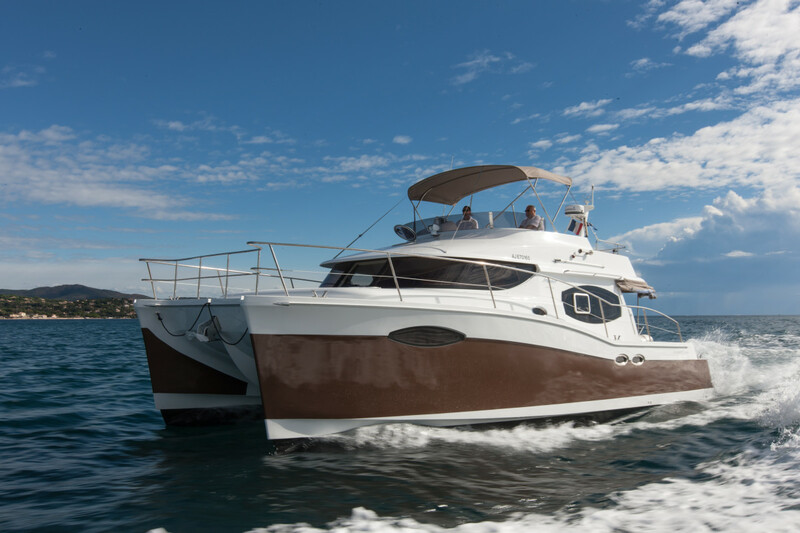 If you’ve never heard of Fountaine Pajot catamarans, you’re about to. In the last 30 years, this well-respected boat builder, founded by Jean François Fountaine in a boatyard near La Rochelle with three partners, has delivered over 2,200 sailing and power catamarans in recent times, and their eyes are firmly fixed on the American market. 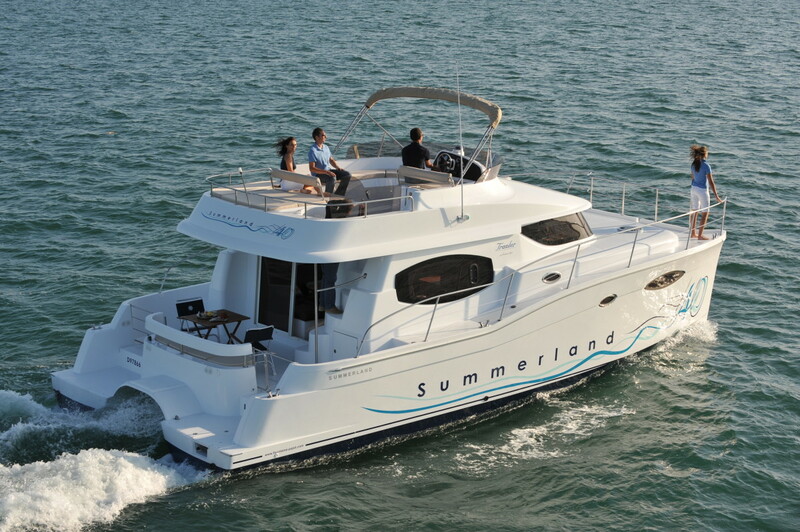 Their lineup of power catamarans ranges from the second generation Summerland 40 LC to the new Cumberland 47 LC and tops out with their flagship Queensland 55. For those who want crisp, distinctive styling, a modern and comfortable interior, and a range of performance that spans from fuel efficiency to fast cruising speeds, their power catamarans make a lot of sense. Awhile back, I had the opportunity to tour one of the first Summerland 40 power cats to come to the U.S. and to get out on the water for a test drive. Walking down the docks to join Hélène de Fontainieu, who handles marketing and public relations for Fountaine Pajot, I stopped to take a long look from a distance. 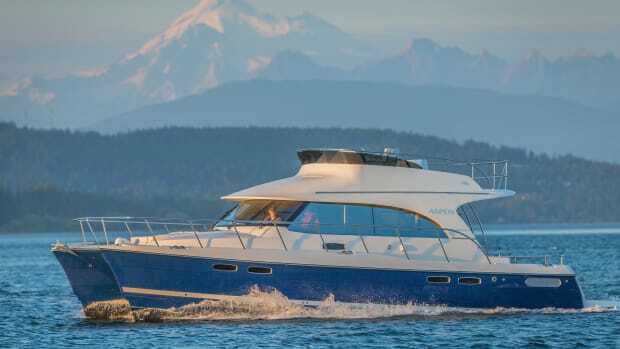 The high freeboard, reverse sheer with a break and the flowing aerodynamic lines of the cabin and flybridge all spoke of a hull that was designed to handle open water and substantial sea state. 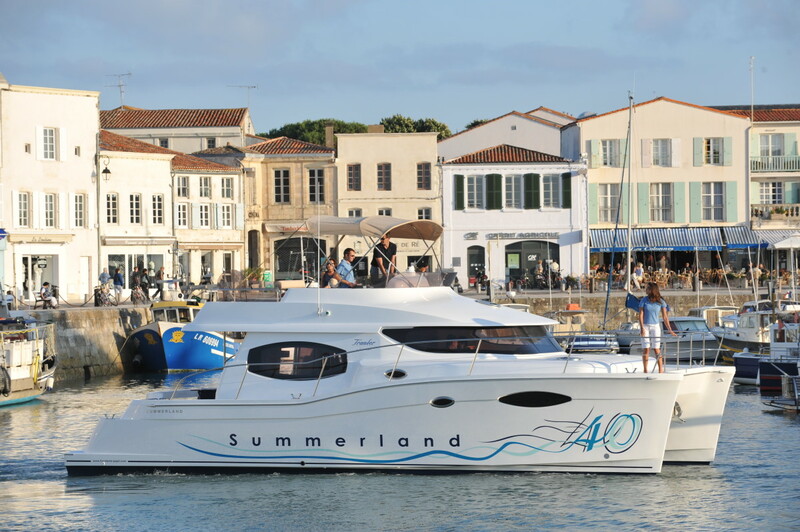 In fact, the Summerland 40 is certified EC Category B for eight persons, meaning it can withstand wave heights up to 13 feet and winds up to 41 knots. The sleek silhouette is beautiful to behold, and incorporates numerous on-deck features to make line handling safe, including wide side decks and high wraparound safety rails. Designed by the well-known naval architecture firm of Joubert & Nivelt, the Summerland 40 features sharp bow entries, which very effectively penetrate oncoming waves, a slightly rockered bottom profile, wide rounded aft running surfaces and skegs which house the engine shafts and go deep enough to protect the four-blade propellers and the rudders. The skegs and the bottom structure are strong enough to support the boat should it dry out and rest on the bottom in regions where the tides are significant. In the event that a skeg should ever sheer off, there is a dedicated watertight bulkhead to help prevent flooding of the engine compartment. Trained fiberglass technicians carefully apply a white ISO gelcoat in a carefully controlled thickness to offer high resistance to UV and yellowing for up to 10 years. Multiple layers of high quality fiberglass and resins are used in a barrier coat to help mitigate osmotic blistering. Resin infusion is used for the remaining layers for both deck and hull molds, giving structures that have higher resin to glass ratios for minimal weight and maximum strength. Full-length stringers and multiple bulkheads add rigidity to the hull shapes. Throughout the entire process, ISO 9001 V2000 standards are observed, with thorough lab testing of each layer of the composite construction. All of this information is archived for future reference. Wide swim platforms at the end of each hull, integral extensions of the bottom, make boarding from either side convenient. 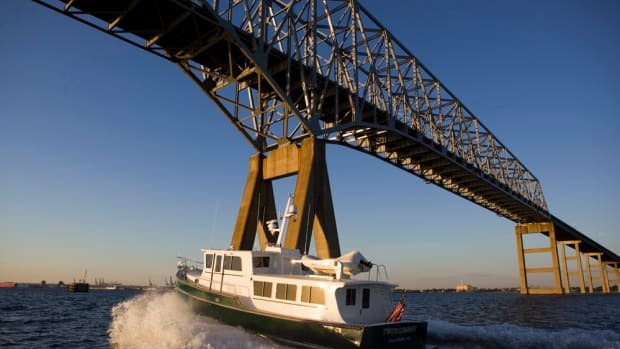 Stepping up to the aft deck, you’ll find a wide space partially covered by the bridge overhang that is equipped with a comfortable built-in lounge across the transom. Three molded steps up to port or starboard takes you to exceptionally wide side decks that are well protected by thigh-high welded stainless steel handrails, which enclose the entire foredeck for safety. Three pairs of open bollard style cleats, mounted atop the gunwales beneath the safety rails, are positioned well out of the walkway to prevent tripping or toe stubbing. This all combines to create a workable on-deck layout that is easily one of the safest I’ve ever walked. Back on the aft deck, I opened the two in-sole hatches over the hulls to examine the storage I suspected to find, and in so doing, found the engines in the forward part of the lockers, enclosed in heavily sound-proofed enclosures. Removing the enclosure tops proved easy enough, and I found that the room around the engines required to perform routine maintenance checks was quite good. 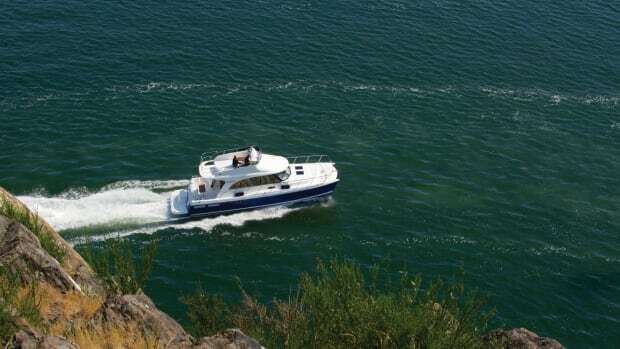 Each engine is supplied by its own fuel tank and 100 Amp-hour starting battery, and there are additional house batteries in the starboard hull. Strainers with seacocks were nearby. The storage here is massive, supplementing the storage beneath the aft bench seat and the locker in the molded spiral stairway that led to the flybridge. The flybridge is spacious and features almost 270-degree wraparound seating to accommodate plenty of guests. 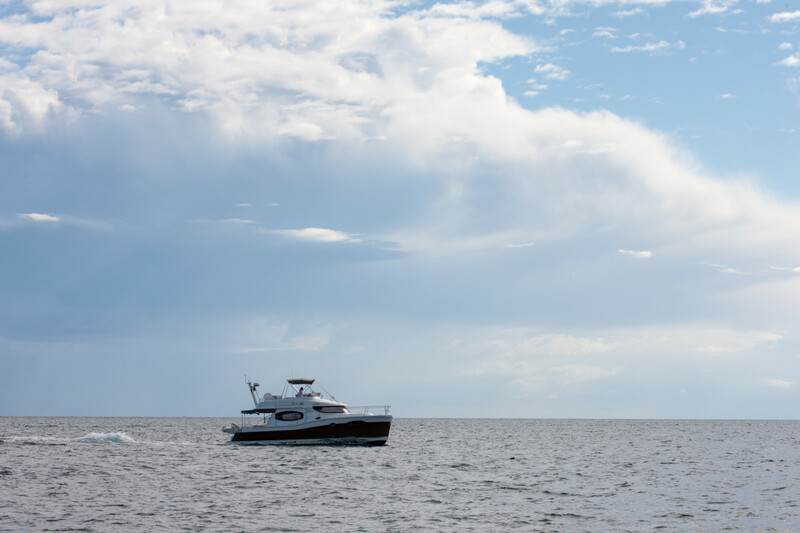 The flybridge is equipped with an opening Altuglass hatch to prevent accidental falls. I would like to have seen a stainless steel handrail, to add security when stepping up to the flybridge or down to the staircase. And while there is a low handrail surrounding the after portion of the flybridge, there is none around the sides or over the top of the curved venturi windscreen. The massive sunpad aft includes a removable backrest, and the comfortable cushions wrap around the port side—more than enough room for eight guests. There is a molded bench seat for two abaft of the helm, with the wheel almost on the centerline. The helm console is large enough for a good-sized multi-function display (MFD), plus a full range of performance instruments. Sight lines on the flybridge are unencumbered, and the view down the stairway gave an excellent perspective on the starboard aft quarter, invaluable when backing into a slip. The original helm had a companion seat to port, but it is gone in the new second generation layout. 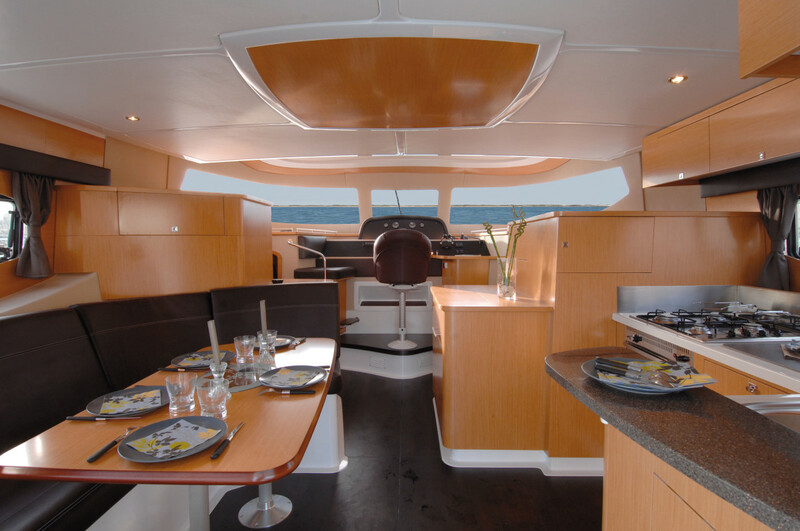 Behind the helm is a brightly lit and well finished galley and saloon, perfect for hosting. A sliding glass door on a raised sill provides access to a cozy main saloon, as well as excellent views aft from the lower helm. Inside, straight grained wood, contemporary leather-like upholstery and solid surface counters dominate the décor. Whether sitting at the port side lounge with table or preparing a meal in the starboard side galley, the views were outstanding aft and to each side. Besides improving the view, the second generation Summerland 40 LC has much larger side windows that increase the ambient light in the saloon, a huge improvement over the original design. Lockers flanking the forward end of the saloon, including the one set to port that houses drawer-style refrigerator and freezer compartments, have been lowered physically, a visual change that is as functional as it is aesthetic. 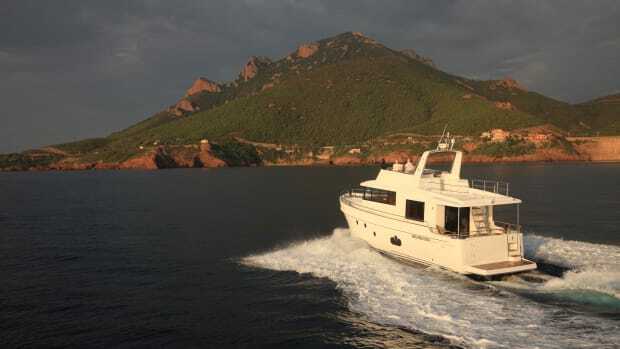 The well-equipped galley has storage above and below a good-sized working surface, with twin stainless steel sinks, a four-burner range and an oven, both using liquid petrolium gas. Sightlines from the helm are much improved by the larger side windows. 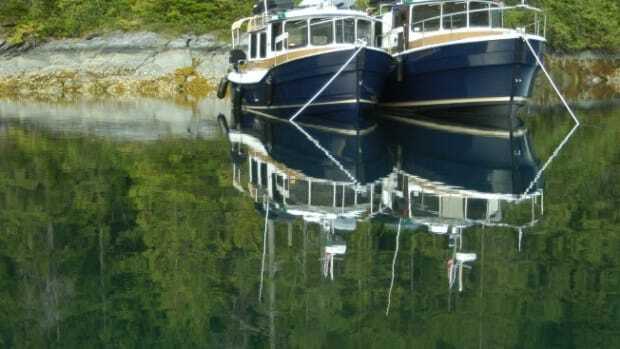 The forward wraparound window sweeps through what must be about 270 degrees, but the low vertical height takes some getting used to after years of exposure to larger reverse-raked windows found on many trawlers. The helm console is modern and clean with a broad, angled surface to port that is large enough for two MFDs, which most serious cruising boats accommodate these days. Call me cranky, but I like at least one MFD to be dead ahead of the wheel, for easy at-a-glance reference, particularly when I’m entering a new harbor. 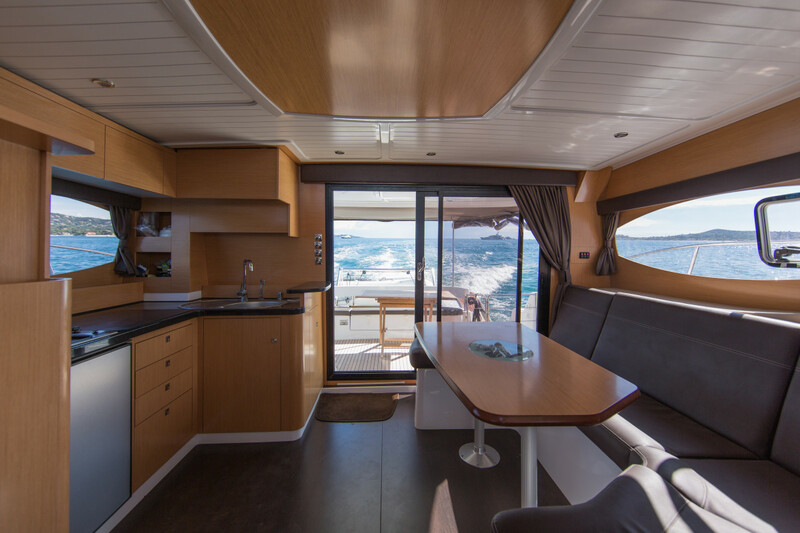 Like most catamarans, accommodations are down stairs on either side of the helm, and the Summerland 40 LC is laid out with two cabins in the port side hull and a spacious master stateroom to starboard. The master is worthy of note due to its athwartships double berth, which has a great view through a portlight and hatch on the hull side, a large hanging locker toward the bow, and a human-sized head compartment with separate shower. Interestingly, there is also a door leading into a storage compartment aft of the head. 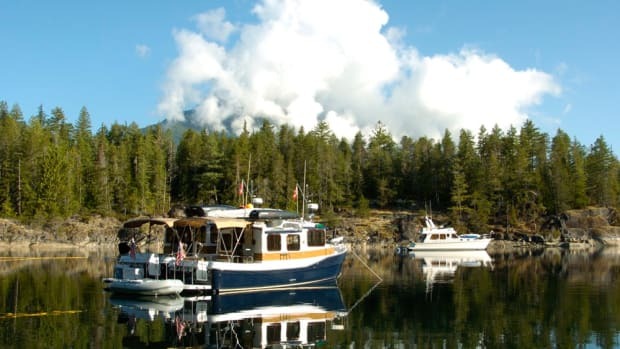 Accommodations are down stairs on either side of the helm, and the Summerland 40 LC is laid out with two cabins in the port side hull and a spacious master stateroom to starboard. Conditions were mild on the Chesapeake Bay on the fall day we took the Summerland 40 for a spin. The boat achieved semi-planing speed smoothly and without hesitation. One-foot chop was no work at all for the sharp stems. High-speed turns were flat and reminded me of the turning characteristics of a much larger vessel. We found a few large wakes to slash through, and the bow rise was negligible. Tracking on all points up, across and down waves was predictably straight, without any hint of untoward yaw, and the roll resistance of the widely spaced twin hulls was simply outstanding. That very same hull configuration made maneuvering around the docks, or into a slip, without a bow or stern thruster, very precise. 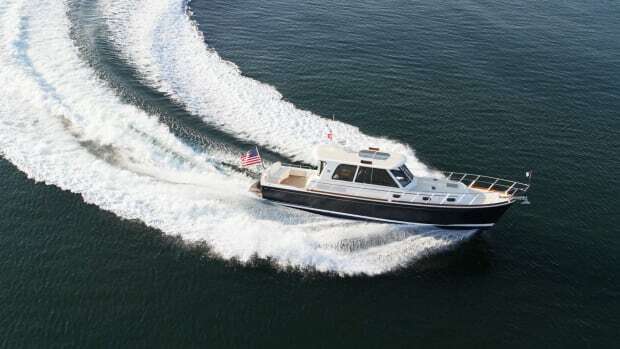 I’d like to have the opportunity to take the Summerland 40 offshore on a long coastal run some time, and see how she handles the vagaries of open water, which was what she is designed for. One thing is sure���her blend of excellent performance and contemporary comfort will make an impression on you that you won’t soon forget. Test Conditions: Air temperature: 71 degrees; Humidity: 60 percent; Wind: 8 knots; Waves: 1-2 feet. Speeds are two-way averages measured with the onboard GPS. Fuel consumption based on Volvo Penta data. Range is based on 90% of advertised fuel capacity. 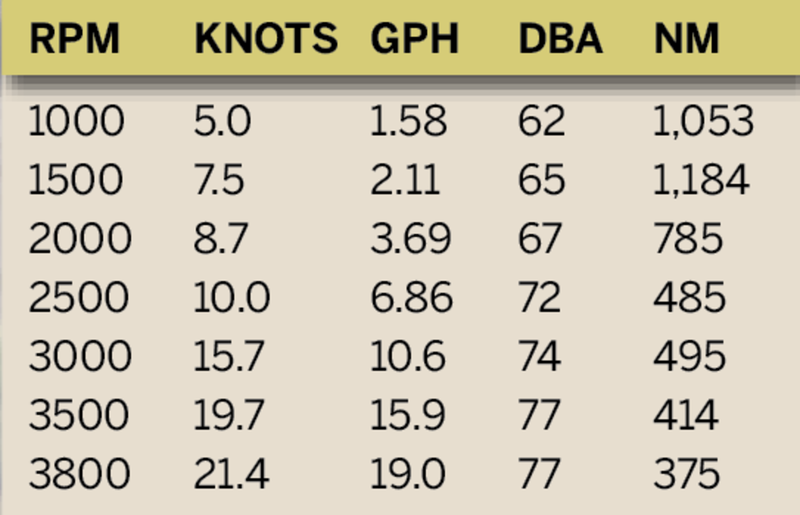 Sound levels measured at the lower helm (65 dBA is the level of normal conversation). Condition of bottom: unknown. Fuel load: 50%. Water: full. Four people aboard.